The deadly hurricane that is sweeping across the Eastern seaboard interrupted early voting in some states Monday, even as Republican presidential candidate Mitt Romney urged voters in Ohio to cast their ballots early. 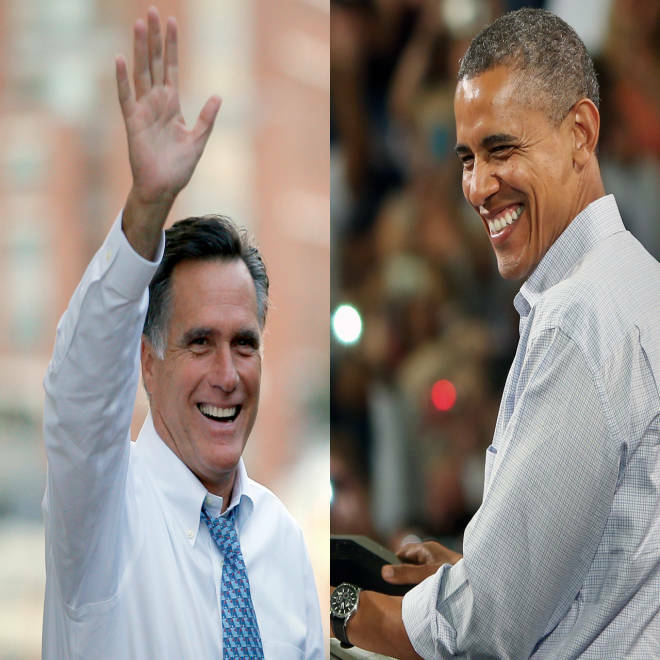 Mitt Romney campaigns in the critical battleground state of Ohio as a poll shows a dead heat between the governor and President Obama. Watch the entire speech. But Hurricane Sandy’s path of disruption and destruction may turn some would-be early voters into old-fashioned Election Day voters if it keeps them from driving or walking to their poll station over the next few days. Early voting has been under way in Ohio since Oct. 2. Much of the state was under high wind warnings from the National Weather Service for Monday and Tuesday. Matt McClellan, a spokesman for Ohio Secretary of State Jon Husted, said Monday that the county boards of elections prepare contingency plans for emergency situations that are reviewed by Husted’s office. “The Secretary of State's office is also receiving daily updates from the Ohio Emergency Management Agency on the weather. We are confident that at this point in time local boards are prepared,” McClellan said. In West Virginia – which, unlike its neighbor Ohio, hasn’t been a hotly contested state in the presidential race – snow was falling Monday as forecasters predicted total snowfall of up to three feet in some parts of the state. Tennant said her office is working with county clerks to develop contingency plans for early voting locations in the event that electricity is cut off. In Maryland, with its coastline directly in the path of Hurricane Sandy, Gov. Martin O’Malley issued an executive order Sunday canceling early voting for Monday and Tuesday and extending the early voting period through Friday. The October surprise came later than usual and the campaigns are left with big decisions – how will the weather we're seeing along the East Coast impact strategy in the battleground states going forward. NBC's Chuck Todd reports. In Virginia, a state that Romney and President Barack Obama have fought fiercely to win, absentee voting is permitted (by mail or in person) in cases where a person will be absent from the state on business on Election Day or in cases of disability or illness. Due to the hurricane, local election offices were closed Monday in several of the state’s largest cities and counties including Loudon County, Arlington County, and Fairfax County. In-person absentee voting in Virginia ends at the close of business on Saturday. Other states in the track of Hurricane Sandy that do not allow for early in-person voting are: New Jersey, Pennsylvania, Delaware, New York, and Connecticut. They do permit absentee ballots to be cast by mail, although in some cases a reason is required. In Pennsylvania, where Vice President Joe Biden will be campaigning Friday and where a pro-Romney Super PAC will be spending $2 million on TV ads in the final days of the campaign, there is no early in-person voting, but voters can mail in an absentee ballot. The deadline in Pennsylvania for applying to a voter’s county Board of Elections for an absentee ballot is Tuesday. Completed absentee ballots must be received by 5 p.m. on Friday, but since this is a presidential election year, the state will count absentee ballots received by the close of the polls on Election Day for the offices of president and vice president. The hurricane’s impact on voters was reaching as far away as Minnesota, where Secretary of State Mark Ritchie told people in his state who were being deployed to the East Coast to assist with the emergency response to Hurricane Sandy to vote absentee-in-person before they leave or to request an absentee ballot. “We want to make sure every eligible Minnesota voter can vote. My office is contacting emergency-response organizations, utility companies and relevant government agencies to ensure that those who have already departed and others who are being mobilized can vote,” Ritchie said in a statement.